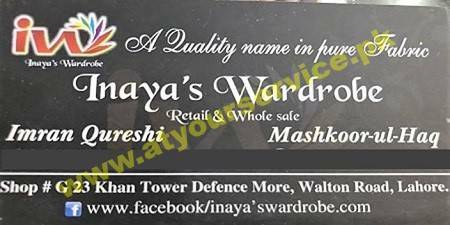 Inaya’s Wardrobe is located in Khan Tower, Defence Mor, Walton Road, Zaman Colony, Lahore. It deals in various designers' dresses in pure China Krinkle, Chiffon, Silk, Pure Lawn. All dresses are available at retails and whole sale rates.